The Second Annual Meeting of the CEPC-SppC International Advisory Committee was held on November 7 and 8, 2016 at the Institute of High Energy Physics (IHEP). Eighteen noted scientists from the international high energy physics community attended the meeting. Prof. Wang Yifang, IHEP director welcomed the committee members. Prof. Lou Xinchou, CEPC-SppC project director reported on the overall status and progress of the project, and group leaders of the CEPC-SppC team reported respectively on the accelerator, detector, theory, site study, international collaboration, global R&D and related topics. 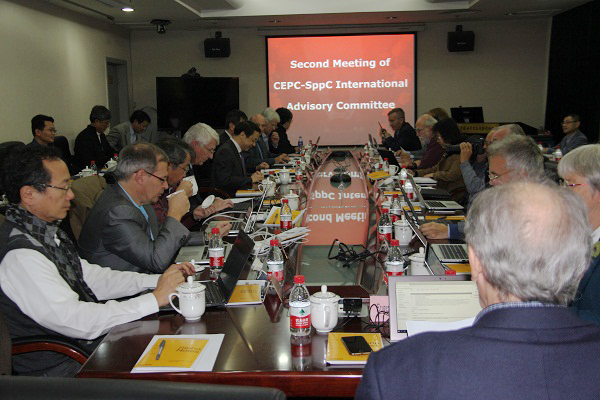 After the talks and discussions, the committee concluded that CEPC-SppC would lead the development of high energy physics in China, propelling China to the forefront of particle physics research. The committee agreed that the creation of an international collaboration would be important to attract international participation, to achieve the best design, and to effectively conduct the R&D necessary to be ready for the construction of the CEPC in the future. The committee also recommended the active pursuit of funding support for R&D from different sources. The committee, founded in May 2015, aims to offer professional advice on the development path of the CEPC-SppC and on issues related to the international collaboration, to build up a framework for future collaboration and to attract more international teams to join the CEPC-SppC study.